According to the U.S. Census Bureau, there are approximately 45.5 million Latinos living in the United States, making up about 15 percent of the total U.S. population. By its sheer size, this voting bloc is emerging as a pivotal constituency in the 2008 presidential election. Furthermore, Latinos are the fastest-growing minority group in the United States, and they are expected to become almost 30 percent of the projected population of 429 million people in the United States by 2050. The political clout of Latinos is being undercut, however. This is not because many are ineligible to vote—by being under 18 or not U.S. citizens, for example—but because many that are eligible to vote are not exercising that right. In 2004, 16.1 million Latinos were eligible to vote, but only 7.6 million voted in the presidential election. And for the elections in 2006, 17.2 million Latinos were eligible to vote, but only 5.8 million went to the polls. The silver lining for the Latino electorate is that over the past few years, Latina women have been making inroads in the American political landscape. Over the past three presidential elections, the number of Latina voters has steadily increased. From 1996 to 2004, votes by Latinas increased by 51 percent, from 2.7 million to 4.1 million. Latinas also turn out to vote in slightly higher numbers than their male counterparts. In 2004, for example, 45 percent of the male Latino electorate voted, compared to 49 percent of Latina women. 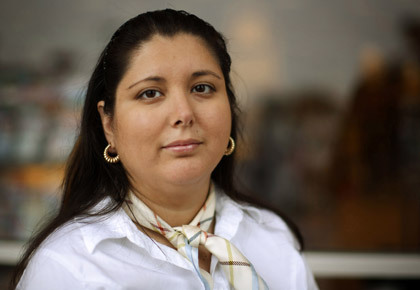 Latinas are also increasingly choosing a career in politics. Between 1996 and 2007, the number of Latinas elected to office nationally and locally increased by 74 percent, compared to a 25 percent increase among their male counterparts. The percentage of the Latina share of all Latino elected officials jumped from 24 percent in 1996 to 31 percent in 2007. Currently, there are 75 Latina state legislators in the United States, which includes 20 senators and 51 representatives serving 22 states. While Latinas have increasingly been more involved in politics, they are still not as engaged as they could be. In the 2004 election, 40 percent of Latinas who were U.S. citizens were not registered to vote. If every eligible Latina had voted, the turnout would have increased by 4.2 million votes. Latinas are much more likely to live in households with lower incomes than their non-Hispanic counterparts (53 percent compared to 34 percent). Latinas are nearly twice as likely to live in poverty compared to non-Hispanic women. Latinas are nearly three times as likely to lack health insurance compared to their white counterparts. This year an estimated 17.9 million Latinos are eligible to vote, and 9.1 million of them are women. It’s not just the size of this electorate that can sway the direction of the upcoming election—it’s where Latinos live that will also play a critical role. Colorado, Florida, Nevada, and New Mexico all have significant Latino populations and all of these states are expected to have closely contested elections. While over 9 million Latina women are eligible to vote in the upcoming election, it’s projected that only 54 percent will actually cast a ballot. This year, let’s defy expectations! Latinas can make a huge difference in this election. Consider what happened in 2000, when the presidential election was decided in a state-by-state contest for electoral votes. George W. Bush prevailed over Al Gore in the Florida recount by only 537 votes. We simply cannot continue to tolerate the status quo. So let’s get out the vote and make our voices heard. Every vote really does make a difference, and for Latinas, there is too much at stake to stay home this November.